Tropic has several excellent choice s for eating out depending on your taste. Whether you in the mood for steak, fish, pizza, southern BBQ, fine dining, or a traditional burger we've got you covered. Breakfast, lunch, and dinner can be found here. Utah's "Mighty Five" are 5 national parks all of which are so diverse, breath-taking, and truly Mighty. Bryce Canyon, Zions, and Capital Reef are all in a days journey from the hotel. Also found along Utah's Scenic Highway 12 are a number of inspiring State Parks and Recreational Areas. Locals know how to experience the 1 million acre monument in their back yard. Click the button above for more information about guided tours on horseback, jeep, ATV's, and more. Even try a river raft adventure on the Sevier River. Known as one of the most beautiful highways in the world, Utah's only All-American Highway offers an experience all its own. Going for a ride means something entirely different when crossing stretches like the hogs back and the Escalante Canyons area. Be sure to make it to the end of the 17 mile drive into Bryce Canyon National Park. The panorama views from Rainbow Point and Yovimpa Point are well worth the drive. A sunset in Escalante stirs the soul. Escalante is along Scenic Highway 12. These are the switchbacks found on the Navajo Loop Trail in Bryce Canyon National Park. The loop offers an opportunity to drop into the canyon on one path and then to climb out on another. This is one of the most popular trials in the park. You can hike into this loop from the Tropic side of the park in the valley below Bryce. The Burr Trail is a spectacular journey through a part of Southern Utah that is the icing on the cake. Long canyon and the switchbacks are a couple of highlights. This makes for a great day trip and you can take in Capitol Reef at the end. The Queens Garden Trail in Bryce Canyon National Park is one of my favorites. It connects with the Navajo Loop Trail. I choose to take the steeper Navajo Loop trail down and then leisurely enjoyed the more gradual Queens Garden trail back to the rim. This trail includes a fun variety of landscapes including several fun tunnels. This was taken along the Escalante River Trail (accessible from Highway 12, about 10 miles east of the town of Escalante). The Escalante River offers views rich with vegetation and slick rock. Take a day and explore the canyons. The Escalante Canyons are waiting to be explored and are found along Highway 12. The Escalante Canyons Marathon is ran on this stretch of road. Boulder to Escalante offers some of the most breath taking and inspiring views you will ever see. The drive alone is an experience all its own. Be sure to allow time to see the highway 12 scenic route. I don't think Bryce Point is the highest view point in the park, but it is up there and on the morning of Christmas Eve it can get pretty cold. But the the cold was so worth it this day. As the sun rose and lit the redrocks on fire, something inside you stirs and warms your soul. The smile on my face temporarily overcame the cold and I decided to stay a little longer. Bryce Canyon in the winter is absolutely stunning. 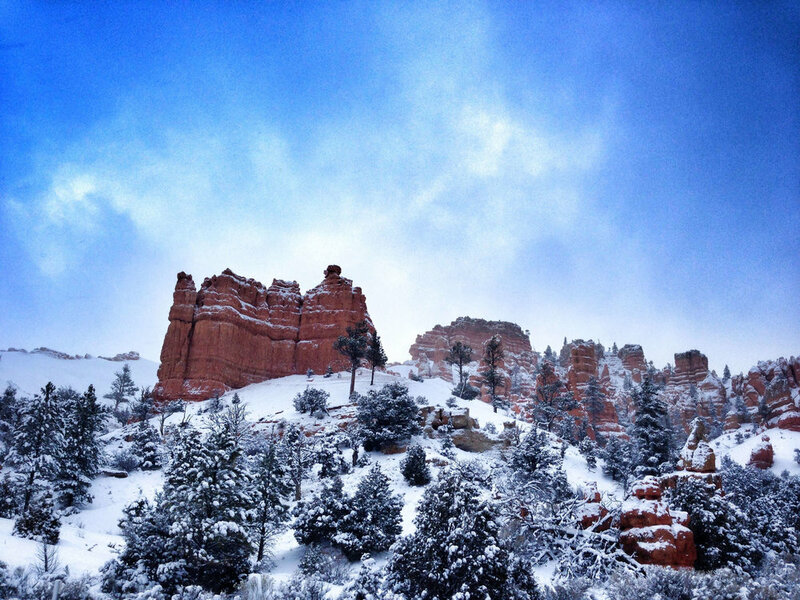 Brave the cold and come see the majesty that is a snow covered Bryce Canyon. This sunset came after a beautiful summer rainstorm that rolled across the plateau. Just on top of "The Dump" the portion of Highway 12 which drops off the rim of Bryce Canyon National Park which leads down into Bryce Valley, this picture was taken looking back to the easterly sunset. It is called "The Dump" because of the old pioneer irrigation ditch that "dumps" off the rim and feeds the irrigation systems for the farmers in Bryce Valley. Probably the most iconic attraction in Bryce Canyon, Thor's Hammer stands alone against a dramatic backdrop. This can be found on the north side of the Navajo Look trail in the park. My favorite time of day to capture this scene is with the morning light. So I am lucky enough to have views like this on a fairly regular basis. This was taken from my back porch on an evening after a massive storm drenched our community. This view is along the road to the Kodachrome Basin State Park (a lesser know hidden treasure in Bryce Valley). This park is about a 20 minute drive from Tropic. This is the valley where the Red Ledges is located. Be sure to enjoy the quiet streets with an evening stroll through town. Stormy days are the best for landscape photography. The BV on the hill is for Bryce Valley which takes in all the three communities in the valley below Bryce Canyon. They are the towns of Tropic, Cannonville, and Henrieville. These towns have a rich heritage of farming and ranching. Be sure to take some time to take in the views these communities offer and stroll the streets to get a feel of what a small town feels like. This view is on the road to the Kodachrome Basin State Park, just south of the town of Cannonville. Summer storms roll through the valleys and the wild turkeys gobble in response to the thunder. Add the smell of rain-soaked sagebrush and you have a perfect summer evening. South of Cannonville there are a number of beautiful and intriguing slot canyons. So many come here to see Bryce Canyon, which is so worth the trip, but spend some extra time with us and explore places like Bull Valley Gorge, Willis Creek, Grosvenors Arch, and the Cottonwood Narrows. Utah's Highway 12 takes you through Red Canyon on your way to the Red Ledges Inn. This canyon has some fantastic hiking trails that take you out into the red rocks and hoodoos. The Dixie National Forest maintains a great visitor center with information about the area and things to do and see. Click here for more information. This view is the inspiration for our hotel name. Powell Point is the south end of the massive mountain range known as the Aquarius Plateau. This point was used as a central focul point in the mapping of this area by the early explorer John Wesley Powell. This the name Powell Point. The red ledges of this landmark light up in the evening as though they are on fire. Different time of the year offer more of a glow than others, but this is the view from out hotel. In addition to the red ledges of Powell Point, the boundaries and red ledges of Bryce Canyon surround us to the north and the west. Although you can't see them from Tropic, Cannonville and the country to the south of us are filled with even more red ledges. So if you love red rocks and all the Southern Utah has to offer come stay at the Red Ledges Inn and enjoy. Dixie National Forest spans the majority of Southern Utah. These mountains are in our back yard just up the road from the National Park.